If flowers tickle your fancy, not to fret my friend! I feel your sentiment and have come up with a handful of bottoms that will do just the thing. Jeans or chinos, when it comes to floral bottoms this spring, size of floral pattern as well as wash can make a big difference. Thus make sure to try on the variety of cuts and textures to find your perfect pair. Wondering how to style them? 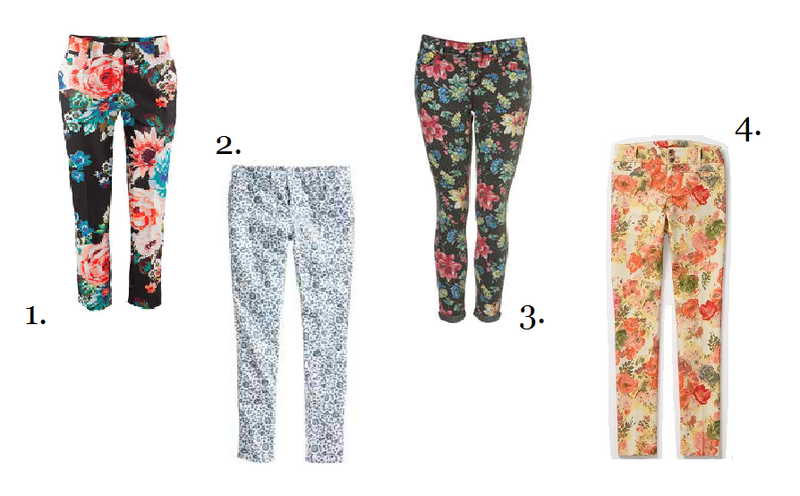 Play it safe and use flowery pants as a statement piece, dressing them up or down. For the risk taker, pair the pants with a contrasting patterned top, having some fun, mixing prints. Still on the search myself, stay tuned!